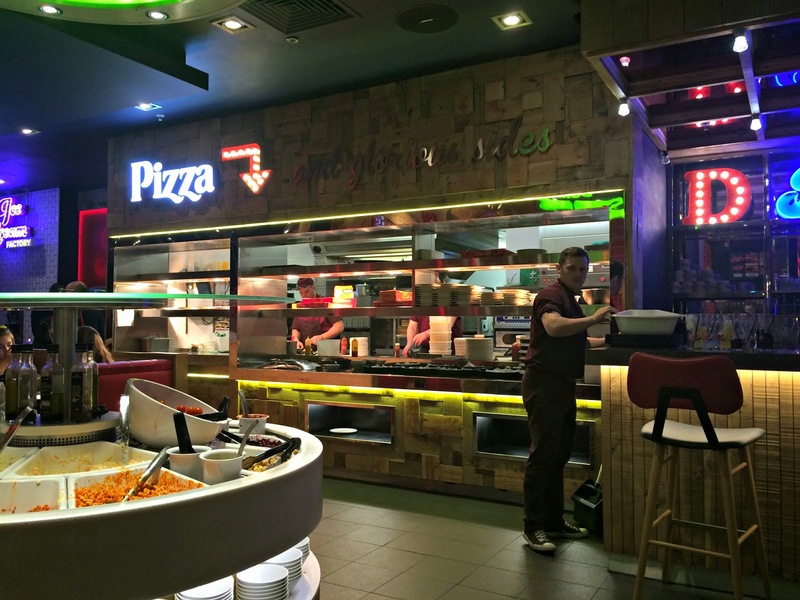 A few weeks ago, Pizza Hut very kindly asked if I would like to go and check out the newly refurbished "Hut. "* Now, our household is one that loves a good pizza. And because we hadn't had one in ages, and I hadn't headed out to a Pizza Hut in a good year or two, one Saturday night, with Boyfriend in tow, we headed out into Liverpool One ready to pig-out on some yummy pizza. I have to say that I was pleasantly surprised when we entered the restaurant. In place of the quintessential Pizza Hut décor I remember from when I was a child, the design was now completely different. 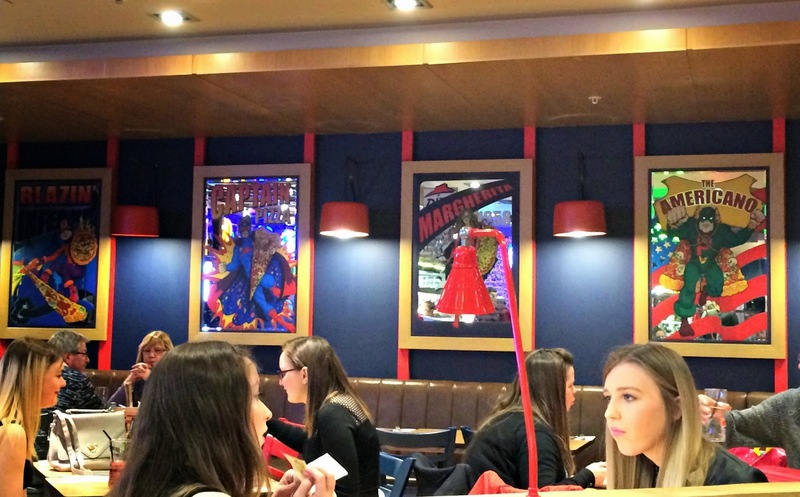 Bright colours, neon lights, and an array of comic-book, cartoon-y characters filled up the walls. It was a very colourful, child and family friendly set-up, and as much as I was liking it as an adult, my eight year old self would have been loving it. The restaurant was also packed, with couples, families and friends alike all chatting and picking up pieces of their pizzas of choice. It was a really lovely atmosphere to be in, and I couldn't wait to take a look at the menu. As well as having a refurnished restaurant, Pizza Hut are also upgrading their menus across Huts nationwide. So naturally, we had already decided that we would be sampling a starter, main and dessert to-boot. Because our household is one that loves all things barbecue, we opted to start with a Meat Sharing Platter for 2. We didn't have to wait long for our order, and when it came out, my tummy did back flips in anticipation. The board was covered in sticky. succulent ribs and chicken wings accompanied by four slices of cheese and bacon garlic bread and two dipping sauces. It was just the right amount for the two of us, and I was happy to taste two different styles of barbecue sauce had been used for the meat. Pizza Hut hasn't been lazy in their choices by just splashing one sauce over everything. One sauce was smoky and dark, and the other sweeter. They both complemented each other perfectly, and I just couldn't help myself but dive in. The dipping sauces were also a great addition, We got to choose the flavours that we wanted, and even though we didn't use them all for the starter, we kept them to one side and used them to dip our pizza crusts in. Considering how busy it was after we'd finished our starter, our pizzas didn't take that long to arrive at all. Boyfriend opted for the Philly Cheese Steak pizza, and I - unable to ignore the barbecue cravings that the starter had ignited - went for the BBQ Americano. We both were sensible and went for the individual size option, which was actually just the right amount of pizza for us. Now, when it comes to BBQ pizzas, it takes a lot to impress me. I've had BBQ pizzas in the past that have been really lack-lustre, with barely any BBQ sauce on. My BBQ Americano did not let me down. The base was soft and plump, piled high with toppings and lashings of BBQ sauce. It had already been cut into slices too, which I really appreciated! I wolfed down slice after slice, dipping the crusts in to the leftover sauce from the starter. The cheese was melted to perfection, making each slice so more-ish. We even managed to get a very cinematic action shot of it...how enticing does that look right now? Boyfriend tucked in to his pizza too with great enthusiasm. His Philly Cheese Steak pizza is a new addition to the menu, and it was a great luxury for him to have steak on his pizza. Of late he has been more drawn towards a cheese and tomato, so it was a credit to the Pizza Hut menu that he branched out! I think the only thing he would have done differently is ask for it on a thinner base. The sauce on the pizza was very creamy, but because he ordered a normal pan base, it got a bit too much towards the end. But that was the only minor detail. Both our pizzas really were delicious! Even though I did have to leave a few slices of my pizza (which the staff kindy boxed up for me to take away,) we knew we wanted to order dessert. And our choice? Two milkshakes. Because the new décor and design has an American diner feel, I think that out us in to that frame of mind. Boyfriend chose the strawberry 'shake, and mine - of course - had to be chocolate! Thick. Creamy. Delicious. Those milkshakes barely touched the side of the glass! They were absolutely scrummy. Made with ice cream, our milkshakes were just the right smooh consistency, and slid down after our pizza feast very nicely! In reality, we probably should have not ordered any dessert, because afterwards we were absolutely stuffed, but they were probably some of the creamiest milkshakes I've ever had! 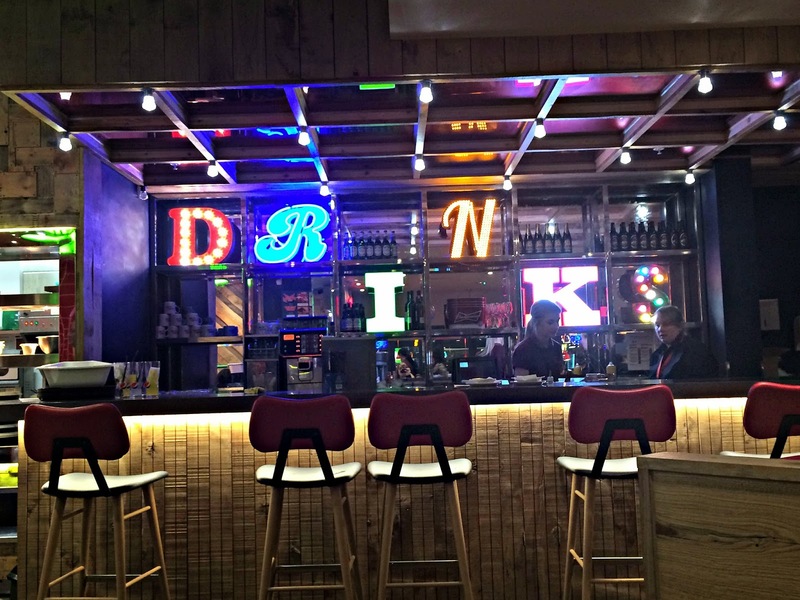 The new Pizza Hut in L1 is modern, funky, and family-friendly. The décor has been revamped and is really fun. 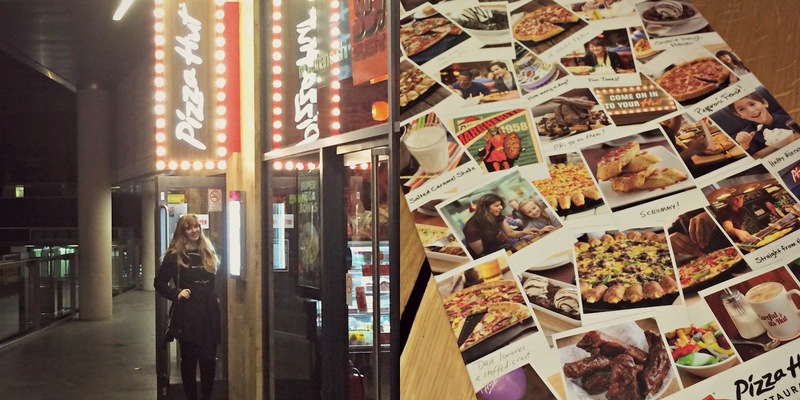 Whether you are looking for somewhere to eat after a day out in town, a place to pop in pre or post cinema, a restaurant to take your friends, or even somewhere fun and friendly for a first date, you should definitely check Pizza Hut out! Before you enter, here are the rules! *Pizza Hut gifted me a giftcard to use to sample the new menu and see the new refurbishments. This does not affect my thoughts and opinions. They are entirely influenced by my experiences and tastebuds All opinions are 100% honest and 100% my own. I love the new look of this Pizza Hut! How great are those comic book style pictures! Hmm my favourite topping... I like to do a 'create your own' with chicken, pepperoni and sweetcorn. Yum! Pizza Hut has come up in the world! This is NOT how I remember it at all! Favourite topping? I like your less than bog standard toppings, for example a few weeks a go I had a black pudding topped pizza...oh my, it was bloody delicious! What an amazing prize and how cool that you got to review it. I love pizza and haven't been to a pizza hut for quite a while. My favourite topping is pineapple, but I also like goats cheese on it which is a bit more unusual. What a great prize and how cool you got to review them. My favourite pizza topping is pineapple, but I really like goats cheese on it too, which is less common. I always go for ham and pineapple on my pizzas! !